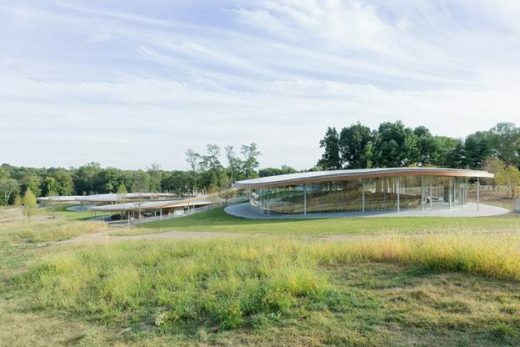 Grace Farms (New Canaan, Connecticut, US) by the firm SANAA is the recipient of the 2014/2015 MCHAP, recognizing the most distinguished architectural works built on the North and South American continents. Kazuko Sejima and Ryue Nishizawa were recognized with the MCHAP Award, the MCHAP Chair at IIT Architecture Chicago for the following academic year, and $50,000 in funding toward research and publication. 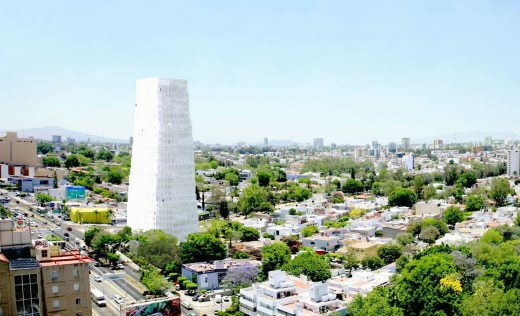 This 25-storey mixed-use office building was to be located in the city of Guadalajara, Jalisco, Mexico. 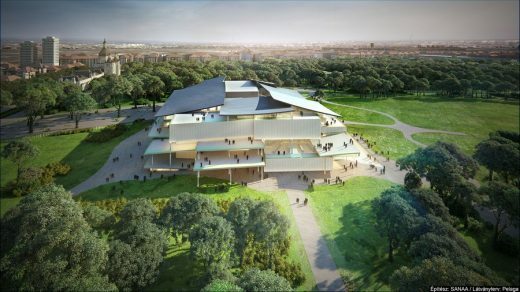 This new building will be built in the Vársoliget (City Park) according to the design made by the internationally renowned Sejima and Nishizawa and Associates architects studio. The new museum is due to open in summer 2019. New photos of this major building – refined but rather austere architecture – redolent of the simple volumes of Mies van der Rohe (eg National Gallery Berlin or Crown Hall) but in a very light style, finely detailed. But when compared with say the Pompidou’s sojourn into the countryside (the rather bizarre Centre Pompidou-Metz by Shigeru Ban) this building, especially the opaque facades, has moments of dullness. A little more Joie de vivre would have been welcome! Playful proposals unveiled for the Bocconi University Campus in Milan, Italy. The design is typical for SANAA architects with organic forms and a central green space. The development is located at the former Centrale del Latte – a Milanese milk-processing plant. 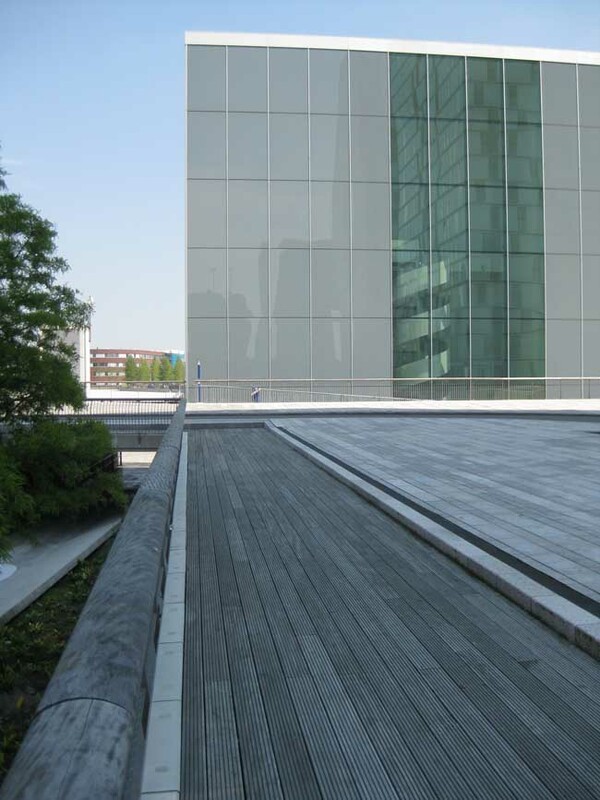 The key elements of the design are a 17,500 sqm public park wwith surrounding dormitories, School of Management, buildings for Bocconi’s Master and Executive programmes and a recreation centre. La Samaritaine on rue de Rivoli is a design by Tokyo-based Pritzker Prize winning architects SANAA (Sejima and Nishizawa and Associates) which was founded in 1995 by Kazuyo Sejima and Ryue Nishizawa have been commissioned by LVMH to completely refurbish the building. 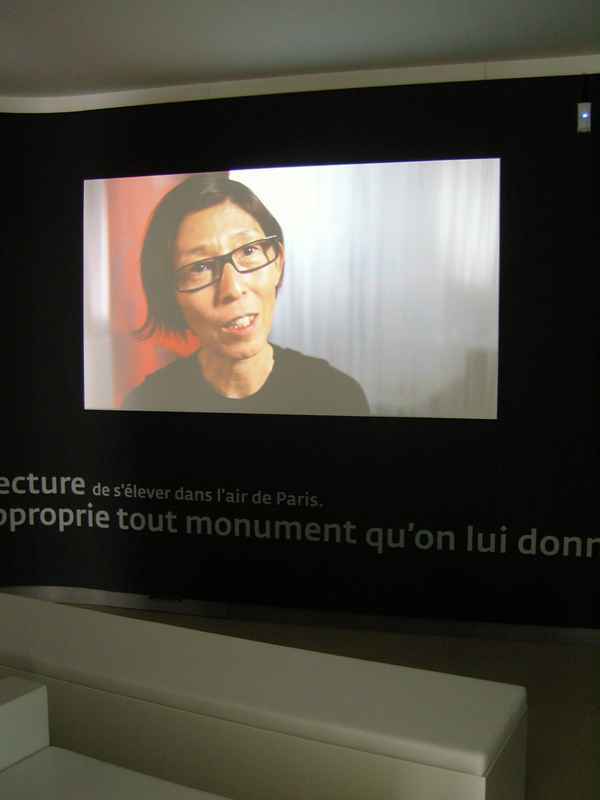 The project is described as the largest privately funded project undertaken in Paris. September 2011, Jerusalem: Japanese architecture firm SANAA in collaboration with the Israeli firm, Nir Kutz Architects, has been chosen to design the Bezalel Academy of Arts and Design’s new campus in Jerusalem’s city center. The meteoric rise of architects SANAA to join the likes of Hadid, Gehry, Nouvel, Ando and Koolhaas as one of the most celebrated architects studios in the world can be traced back to the New Contemporary Art Museum building in New York. But since then the architects have kept surprising us with totally new designs (unlike Gehry they don’t have a specific house style). 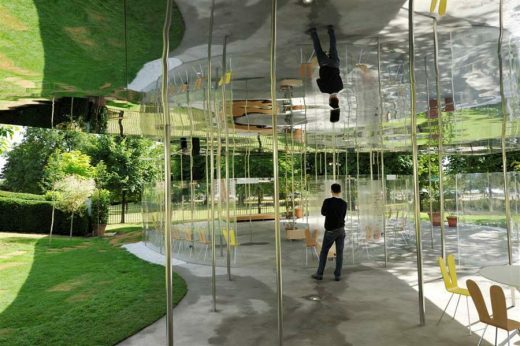 Key buildings by SANAA are the Rolex Learning Center (Switzerland), Serpentine Gallery Pavilion 2009 (UK), the 21st Century Museum of Contemporary Art in Kanazawa (Japan) and most recently the superb Teshima Art Museum (Japan). Each design by SANAA architects is creative and thoughtful, rising above mere architectural fashion [e-architect Editor Adrian Welch]. SANAA : Further Information on buildings, awards, publications, etc. Principles Kazuyo Sejima and Ryue Nishizawa have, in a short time, developed SANAA from a Japanese partnership to a globally-recognized architects studio responsible for high-profile projects including The 21st Century Museum of Contemporary Art in Kanazawa, Japan, The Glass Pavilion at the Toledo Museum of Art in Ohio, the New Contemporary Art Museum building in Manhattan and the Christian Dior building in Omotesando, Tokyo. October 10, 2016 in Architects.